NH waterfall -- can someone help identify? 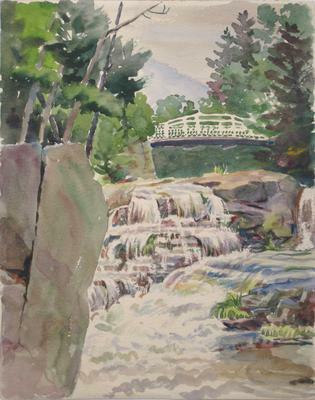 This is a watercolor done by my grandfather in the 1930's or early 1940's. He loved NH and spent his college summers working at Profile Lake (before WWI) ... continued to return for part of most summers as his children were growing up, so we are pretty certain the location would be in NH. We would love to discover which waterfall this is in hopes of some day visiting it to see it in person.